OVER £500,000 FOR FOUR COMMUNITY OWNERSHIP PROJECTS. A sports hall in Easterhouse, a disused mill in John O'Groats, an area of amenity land in Strathpeffer and a stretch of foreshore on the Isle of Skye will soon be in the hands of local people as four community groups receive financial support from the Scottish Land Fund. Announcement of the grants was made by Minister, Cabinet Secretary for Land Reform, Roseanna Cunningham. 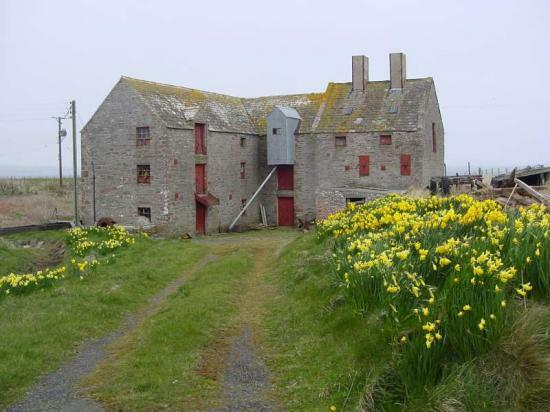 The largest of the latest round of grants announced today was made to John O'Groats Mill Trust, which has received £348,064 to acquire the B-listed, disused John O'Groats Mill along with 9.5 acres of land and two self-catering holiday cottages. The Trust intends to restore the Mill to its former working condition and develop it as a visitor attraction and a social and heritage centre, creating a number of employment, volunteering, training, and skills development opportunities. Rognvald Brown, John O’ Groats Mill Trust, said: "Thanks to this award from the Scottish Land Fund our community can begin to benefit from this iconic facility in our midst and make it a social, educational, cultural and heritage hub. We realise there are still many steps and lots of hard work on the way to achieving all our goals, but with this vote of confidence comes a tremendous sense of empowerment." Connect Community Trust in the Wellhouse area of Easterhouse, Glasgow has received £114,732 to purchase the HubSports building, which they have been leasing from Glasgow City Council for more than a decade. Linda Granger, Director of Connect Community Trust, said: "We are unbelievably thankful to the Scottish Land Fund for making this possible. We refurbished the building in 2008 when we first took on the lease after it was left a eye sore in the community due to flood damage and now, 10 years on, we are going to own the facility, it's fantastic. Connect has operated in the Wellhouse area for 16 years and we've supported local people to make life changes and to change perceptions of the area. Our plans are for a further refurbishment of the building and, with the support from the Scottish Land Fund for a staff post, we know that the facility will become the heart of the community. Strathpeffer Residents Association has received £38,025 to purchase a four-acre site in Strathpeffer, from Highland Council. The Association aims to develop the overgrown site into a community park and amenity space with one dedicated play areas for toddlers and a second for under 12-year olds, with full disability access. There are also plans for a community orchard and for food growing facilities. David Genney, Chair of the Strathpeffer Residents' Association, said: "This Scottish Land Fund award is a huge boost to our ambition to develop Strathpeffer Community Park. The award will allow us to purchase the land and also pay for the vital fundraising and project management expertise we need to finance and deliver the various elements of the project. "Following further fundraising the finished park will include, amongst other things, a children's play park for toddlers and older children, an all ability path network, a community orchard and a cycle pump track. The park will make Strathpeffer a more attractive and healthier place for locals and visitors alike." And The Glendale Trust on Skye has received £15,000 to purchase an area of foreshore currently owned and managed by the Crown Estate, along with a former croft. Ownership of these sites, which amount to four acres, will allow the community to manage the marine assets; to develop plans for improved facilities and to make improvements to the local environment. Clare Gray, Project Manager, The Glendale Trust, said: "We are very pleased that the Scottish Land Fund has chosen to invest in the community of Glendale. The Trust acquired Meanish Pier and slipway from Highland Council some years ago and this award will enable the community to purchase the foreshore and an adjacent piece of land. In turn, a small commercial fish farm will lease facilities in return for necessary improvements and an annual income for the life of the farm. The income will make the community of Glendale less reliant on grants to fund projects that will enhance the lives of residents, and provide opportunities for further economic growth in the community." Minister, Cabinet Secretary for Land Reform Roseanna Cunningham said of today’s grants, totalling £515,821, said: “I am delighted that the Scottish Land Fund has awarded grants to these worthwhile projects. Across Scotland, more and more communities are coming to the Fund with plans for land and buildings to benefit local people. The projects are diverse but what they have in common is the hard work and dedication of the volunteers involved - well done to all of them". • The Scottish Land Fund reopened to applications in April 2016. The programme is funded by the Scottish Government and delivered in partnership by the National Lottery Community Fund and Highlands and Islands Enterprise, both of which have extensive experience of helping communities to acquire and develop their assets for over a decade. • The SLF Committee was appointed following the normal procedures for public appointments.